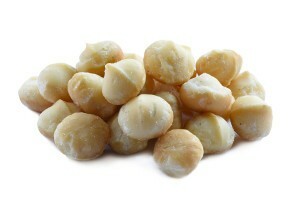 A macadamia nut is the smooth, ivory-colored kernel that is encased in the husk of the fruit grown on a Macadamia tree. These nuts are packed with nutrients, minerals, antioxidants and vitamins that are essential for overall wellness and optimum health. They have a slightly sweet, buttery flavor. They can be enjoyed by the handful as a delectable snack or incorporated into a variety of sweet and savory dishes. Macadamia nuts are tree nuts. The Macadamia tree is an evergreen that can grow up to 39 feet. The tree begins to produce seeds when it is seven to ten years old. A ten year old tree can produce up to fifty pounds of seeds with that amount increasing as the tree ages. The tree has elliptical shaped leaves and long, slender flowers. The fruit has a hard, woody husk. Macadamia nuts were first cultivated in Australia. They are actually sometimes referred to as Australian nuts or Queensland nuts. This type of nut is grown commercially in orchards. At the present time, Hawaii is the largest producer of this variety of nut. Macadamias can also be grown on a scale that approaches commercial production in California. The harvesting of macadamias is typically done from July to March. On average, they are harvested every four weeks. They are sometimes harvested by hand. However, a more cost-effective process for commercial growers is to harvest the nuts using as mechanical sweeper and pickup device. Macadamias can be incorporated into a health conscious diet due to their many nutritional benefits. As a cholesterol free food, they are an ideal snack option for those striving to achieve and maintain healthy cholesterol levels. For those on a Paleo diet or someone needing gluten-free food choices, macadamias are a delicious treat that can be incorporated into their diet plan. These nuts are a good source of energy. To maintain optimum health, it’s essential that you get a sufficient amount of fiber in your diet. In 100g of these nuts you acquire 23% of the daily-recommended amount of dietary fiber. That is a significant percentage from a single food source. Adding these nuts to your diet will also provide you with a good percentage of calcium, iron, selenium, copper, phosphorous, zinc, magnesium and manganese. A 100g serving of macadamias contains a good percentage of niacin, pyridozine (vitamin B-6), thiamin and riboflavin. These nuts also contain vitamin A and E.
Macadamia nuts are among the fattiest of all nuts. That is actually one of its benefits because the majority of the fat they contain is monounsaturated fat. Typically, olive oil is promoted as a good source of monounsaturated fatty acids. Olive oil contains 55% to 83% monounsaturated fats. In comparison, macadamia nuts contain 82% MUF. It’s important to note that fatty acids support a healthy cardiovascular system. The content of Omega-6 fats in these nuts is less than you’ll find in many other nuts. That facts makes them a good anti-inflammatory food to add to your diet. Some studies indicate that this nut can be included on the list of anti-inflammatory foods. Obtaining a sufficient amount of protein is necessary for muscle growth and repair. Getting enough protein in your diet is also essential to maintaining a properly functioning immune system. Making bulk macadamia nuts purchases is a good way to assure that you have a consistent supply of a protein rich snack. These nuts contain the essential amino acids. They are a healthy, tasty, versatile protein source of vegetarians. Research indicates that monounsaturated fats help lower bad cholesterol (LDL) and increase (HDL) good cholesterol. Macadamia nuts are a rich source of monounsaturated fats. Because they are a cholesterol free food, they can be included in a heart healthy diet that includes proper cholesterol management. At first glance, you may be inclined to refrain from including macadamia nuts in a weight loss plan. Closer investigation will indicate that you don’t have to deprive yourself of the this decadent treat. One ounce of these nuts contains 200 calories. However, in that small serving of nuts, you’ll be getting palmitolec acid which increases fat metabolism and reduces fat storage. In addition, you will also get omega 7 fatty oil which controls the burning of fat and helps curb appetite. The fiber and fatty acids in these nuts make them a satisfying food. A food that makes you feel full and reduces your desire to snack is an excellent choice for a weight loss diet. Macadamias nuts have numerous health benefits. As previously mentioned, they can be a vital part of a heart healthy diet. They can lower triglyceride levels, reduce the risk of coronary artery disease, reduce cholesterol levels and clean the arteries. In addition to providing benefits to support heart health, these nuts also have a positive effect on bone health. They contain Omega 3 which prevents osteoporosis and reduces the severity of arthritis. The manganese content in these nuts can help the skeleton stay strong. Not only will including these nuts in your diet help your bones, it will also provide support for the health of your teeth, skin and nails. In addition to that, you will be gaining the benefits derived from the high flavoniod content of this nut. Flavonoids help protect against environmental toxins. They convert into antioxidants that destroy free radicals and protect your body from various diseases. These antioxidants also help reduce the risk of breast, cervical, prostate. lung and stomach cancer. The fiber content of these nuts helps maintain a healthy digestive system. The copper content along with the magnesium and manganese in these nuts play a vital role in supporting brain healthy. Your hair, eyes and connective tissues also benefit from the high copper content in these nuts. A lot of attention is currently being directed to the averse affects of chronic inflammation. Chronic inflammation is believed to be a contributing factor in heart disease, diabetes, cancer and various other conditions. Macadamias nuts are considered to be an anti-inflammatory food. That makes them a good choice of snack and an acceptable recipe ingredient for those on an anti-inflammatory diet.